For some reason he doesn't count the Zombeasts as minions. Played today as warlock in the brawl, got Renounce and ofc I had to meme, so I got hunter cards and the dk in hand. In late game I had 5 minions in hand including him, played him and nothing happened. You can't run Jade Lightning in Warlock. Even if you could, it would be worse than this. I am seriously considering paying dust for this even though it's lifespan is relatively short. It works wonders with the current battlecry warlock. Its alot less tempting to craft TGT cards now indeed. Crafted Chillmaw recently and concidering this guy now. Did you end up crafting him? Yes I crafted him and one sea giant. The sea giant seems to work amazing and Mr. Impaler seems to hit his mark pretty much every game. 8 damage to the face with brann for the win feels good. Make sure to have a crazed alchemist in your deck for doomsayers so this procs. I unpacked him, was like 'I'll just disenchant him', but decided to try him out in my Midrange Shaman deck. It's not a win condition, but it definitely helps you get there. I think he's a fair card that isn't op, but he actually can help you out in a lot of situations. Just cause a card isn't played or looked upon highly, doesn't mean its useless. 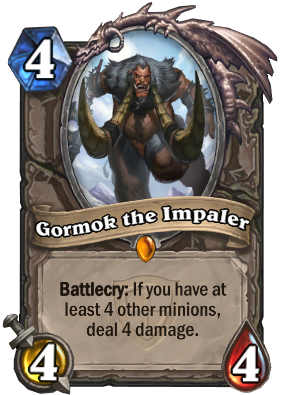 Maybe with standard he will see a little more play, but definitely a pretty interesting card, not worth crafting but if you unpack him he is probably more useful in your collection then as dust. He has become really good in Warlock zoo in Standard! This card is really underrated. It's crazy to me that nobody has brought up knife juggler. A paladin with a live juggler can have a pretty rad turn with this fella and a muster. Haunted creeper can trade something down too 4 health and net you a minion which might make gormok activate. If big game hunter sees tempo plays, so can this guy. Use him in any kind of zoo, why would you dust him?! It's an amazing kinda utility card. Burst on a battlecry minion sometimes can be devastating, and this one is an amazing example. I think that he mean ''craft'' it. Not disenchant. This is a pretty underrated card. With the prerequisite of 4 minions fulfilled, doing a 4-damage and adding a 4/4 body on the board is pretty decent. Just have to be careful of potential AoEs that could wipe you out, such as Flamestrike, Lightbomb, etc. Or you could play it as a surprise finisher; who knows you could combo with Brann Bronzebeard with just 3 other minions on board, with a 8-damage? Great for specific classes, with abilities to pump/flood the board with small minions. The first Legendary I ever opened, i've got mixed feelings about him. Of course a very good card in token decks, esp. not too difficult to get 4 minions in Zoolock with Imp Master, Imp Gang Boss and Imp-losion. Now even better as there is further synergy with LoE cards like Reliquary Seeker, Brann Bronzebeard and Rumbling Elemental. However I can't help compare it with Goblin Blastmage and feeling it's not quite right that a Rare (even if it's a class specific) is easier to trigger, for only a slightly worse (on average - in some situations the 4 random is better) battlecry, and has a stronger body, than a Legendary. Still, this is on my list of cards to craft at some point. Great fun in hobgoblin flood! Was my first TGT legendary, and at first I was disappointing, but after playing him in my own (pre LOE) murloc paladin and now my own version of Zalae's deck, he's one of the most useful and fun cards I have.